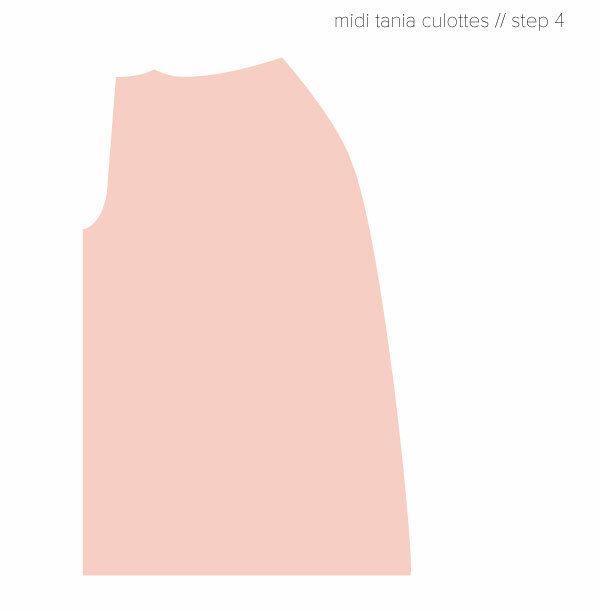 Tutorial // how to make midi Tania culottes! YOU GUYS! i am so so excited to share this tutorial with you!! 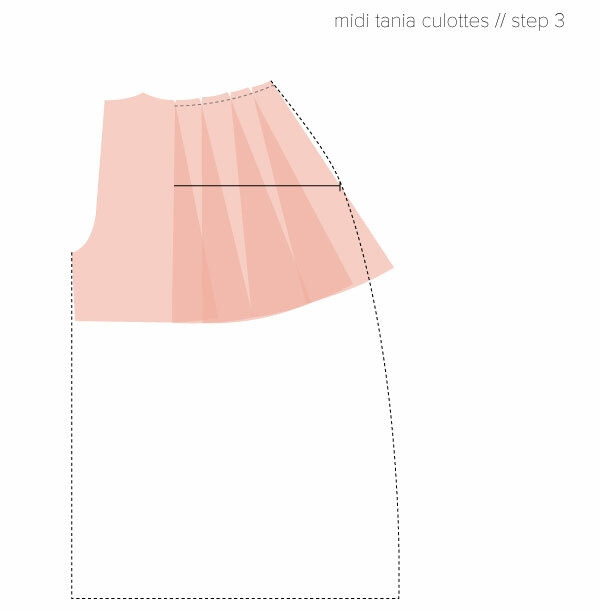 I have had sooooo many requests for a tutorial on how to make the Tania culottes midi length, and i’ve tried out a couple of methods to find what i think works well, whilst still maintaining the original feel of the Tania culottes. 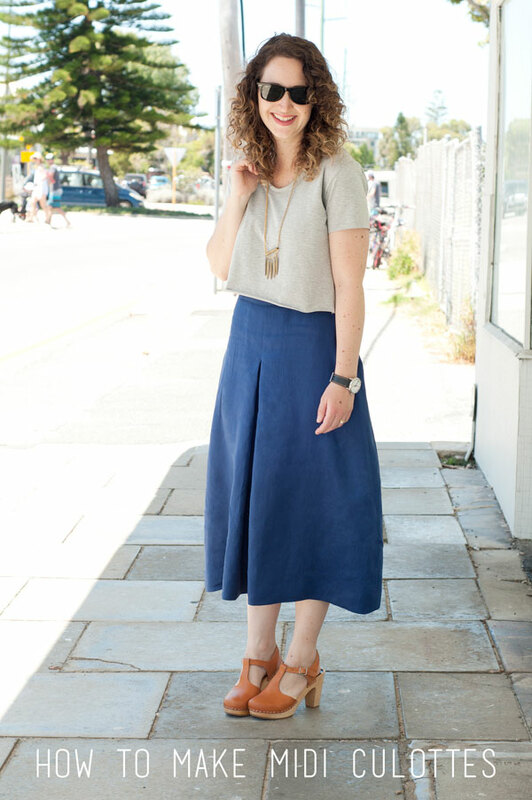 The thing that makes the Tania culottes so special is the fact that they really look like a skirt and i wanted that effect to remain when lengthened. OK so i’ve prepared two methods for you. 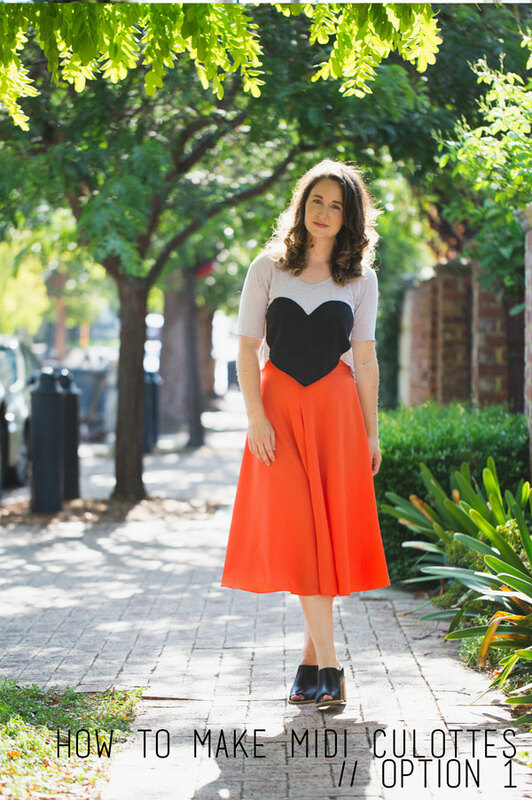 The first method is for culottes that are very drapey, like the orange pair i shared in my last post, and have a very similar shape to the original culottes. This method will use more fabric, so keep that in mind. 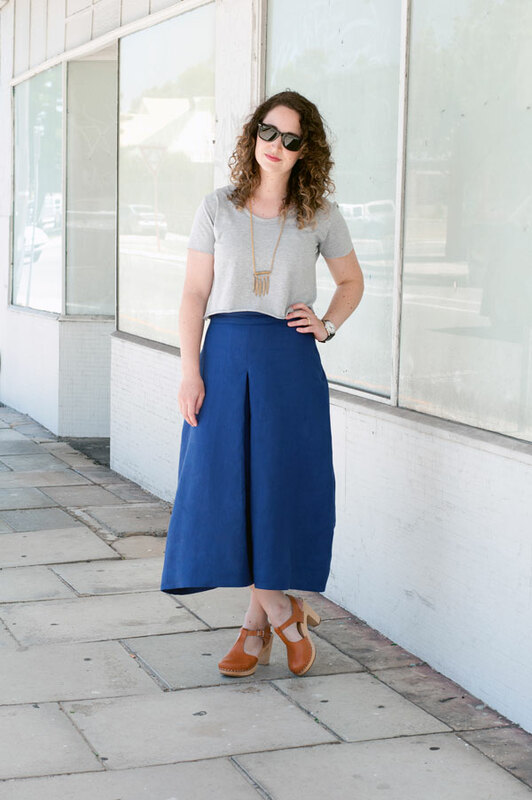 The second option is for culottes that are more structured, and have less flow. This is a great option for your more structured stiff fabrics, and also for any fabrics that are narrower. When i made the second option i was able to place my pattern pieces on folded fabric rather than single layer to cut, and that was really really nice. Ready? click through for the details! Before you make any changes trace your pattern pieces to preserve the original pattern. 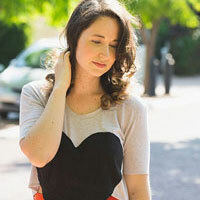 Mark the seamline along the waist of your pattern pieces, and draw slash lines to the hemline. 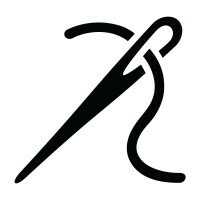 Cut along your slash lines from hem to seamline, and from waist to seamline, but being careful not to cut through the seamline. You want to leave a very small amount of paper intact so that we can pivot the pieces easily. Decide how much ease you want at hip level. I still wanted a lot of flow, so i went for a total of 8″ ease, which is 2″ over each pattern piece. Measure horizontally at hip level and mark this point, it should equal (Hip/4) + (Ease/4) + seam allowance. For me this was 40/4 + 8/4 + 5/8 = 12 5/8″. Overlap the pattern pieces until the side seam reaches that point and tape it all together. 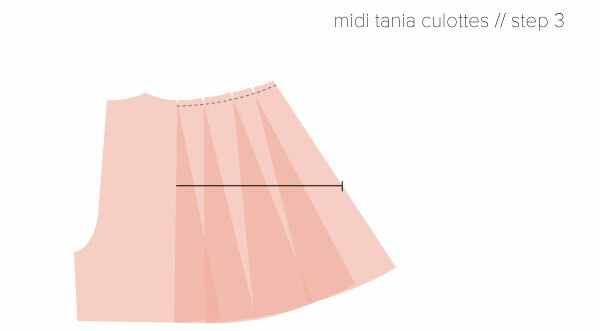 Extend the inseam and side seam till you reach midi length or your prefered length and redraw the hemline curve. Decide how much ease you want at hip level. I wanted this pair to be more straight and less flowy so i used only 2″ of ease, which is 1/2″ over each pattern piece. Measure horizontally at hip level and mark this point, it should equal (Hip/4) + (Ease/4) + seam allowance. For me this was 40/4 + 2/4 + 5/8 = 11 1/8″. Overlap the pattern pieces until the side seam reaches that point and tape it all together. Curve the seamline from waist to hip and then straight down to the hemline. 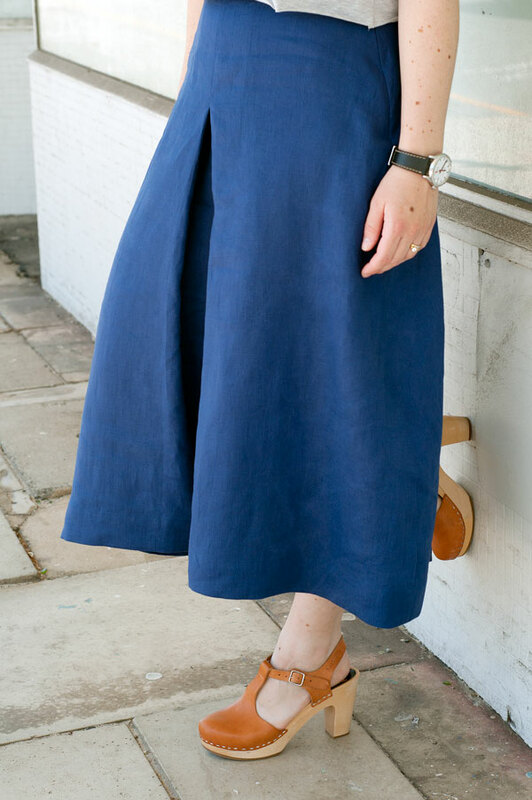 You can choose how wide you want your culottes to be – mine front pattern piece is 22″ at the hemline and my back pattern piece is 24″ at the hemline. 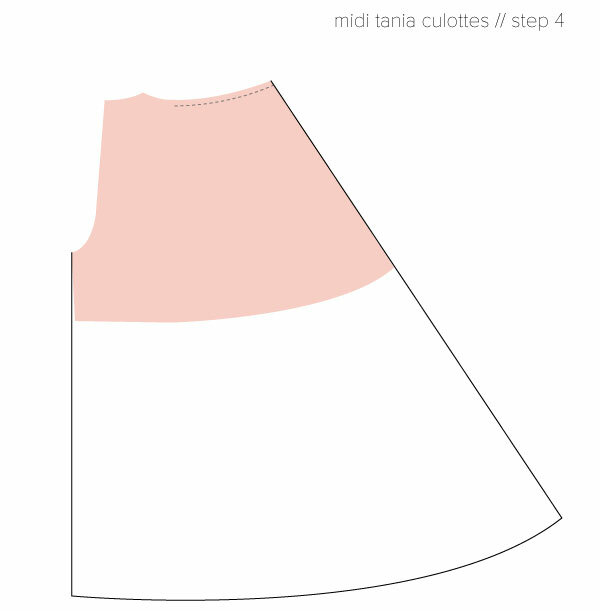 Now repeat for the back pattern piece and sew your culottes according to the Tania culottes pattern instructions. For this option i decided to use a nice wide hemline to maintain the structure of the linen. 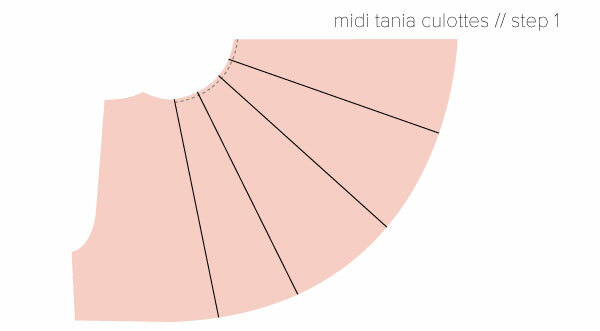 I hope this helps you make your own midi culottes!! 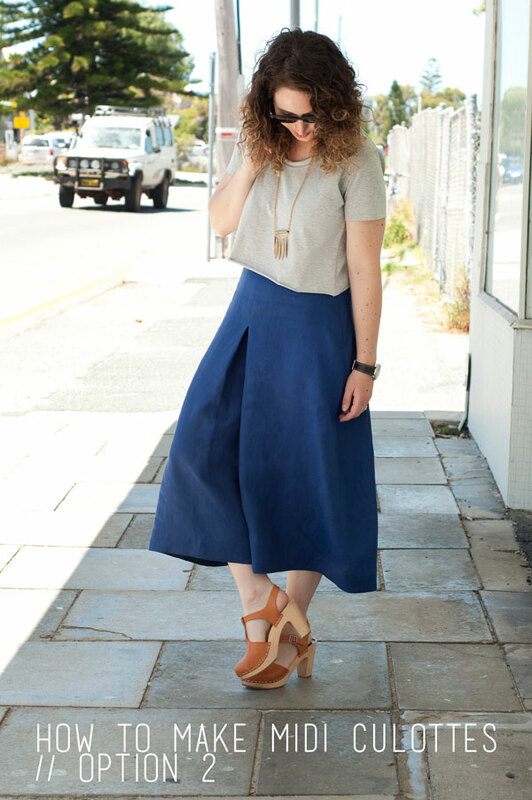 If you haven’t already purchased the Tania culottes pattern, stay tuned! 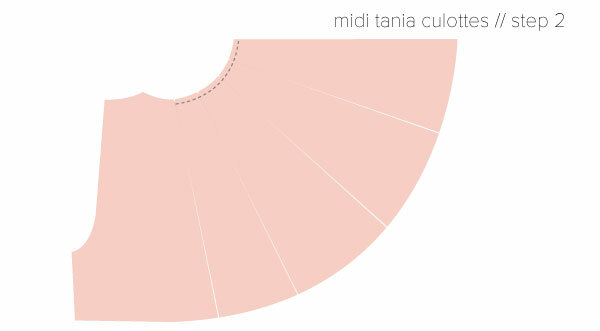 Due to the overwhelming response to this variation, I’m planning on including it in the next release of the Tania pattern. ah, thanks! After reading your reply I went back and reread the tutorial and realised that you did in fact slash and overlap…in my brain, it was slashing and spreading, and I had no idea why a longer pair of culottes also needed more ease. dur Kieran! Thanks for answering! Another one of your amazing tutorials to add to my ever growing to-do list; does anyone else find it hard to fit everything in? I love the orange version! I like that they aren’t super obvious as culottes. I am definitely adding these to my to sew list. This tutorial is great, thank you! The Tania culottes were my #1 essential pair of shorts last summer and I JUST (literally yesterday, in fact I still have to give the hem one more press) got done making another pair to take on vacation next month. While I love the “mini without being indecent because they’re actually shorts” length, I’ve often wondered how I could lengthen them to the knee without having to add another seam, and here you are with the perfect answer to my question :) thank you!! Is there a ‘print at copy shop’ version of this pattern available? I bought the .pdf, but if there’s an option other than letter, it’d be great.